KAZAN, Russia — Throughout his swims here this week, a couple fans in the stands at Kazan Arena have held up a sign that proclaims, “Ryan Lochte is the best swimmer in the world.” Well. Katie Ledecky? Who anchored the U.S. women's 4x200 relay team to gold Thursday, her fourth gold (amid two world records), with the 800 freestyle -- a lock -- still coming up? Lochte, meanwhile, cruised to victory Thursday night in the 200-meter individual medley, a race that hearkened back to the good ol’ days when the Americans would line ‘em up and the rest of the world would submit. Lochte had been dominant in the rounds of the 200 IM and the final proved no different. He won in 1:55.81, 84-hundredths of a second ahead of Brazil’s Thiago Pereira. China’s Wang Shun took third, a flat one second back. After Thursday, five days into this eight-day meet, the U.S. swim team held 11 medals. After Day 5 of the 2013 worlds, the Americans had 18 medals. This much is so clear: the U.S. is on pace for one of its most perplexing worlds, ever. With a year to go before the start of the Rio Olympics — the one-year out anniversary came Wednesday — the issue now squarely confronting USA Swimming is whether this meet will do what needs to be done: serve as a major wake-up call. "Missy Franklin. Ryan Lochte. Katie Ledecky. This is all?" a key figure in international swimming said Thursday night. Franklin, who swam lead-off on the 4x2 relay, won her 10th career world championship gold medal, most ever. (Libby Trickett of Australia has nine.) 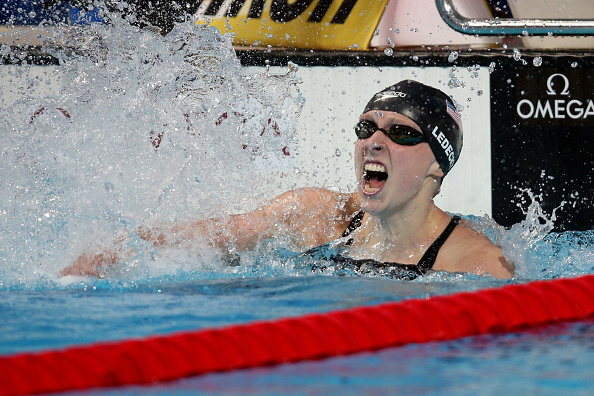 Ledecky now has eight world golds. The U.S., with those 11, on top. China, 10. Australia and Great Britain, seven apiece. Ning Zetao became China’s first male sprint world champion, winning the 100 free Thursday night in 47.84, best in the world in 2015. American Nathan Adrian, the 2012 London Games gold medalist, finished in a tie for seventh, at 48.31. Ning, speaking through a translator, said at a post-race news conference that it is "a dream of Asia, a dream of China" to win sprint golds. Asked if he thought his life would change because of Thursday's victory, he said no. He had saluted as the Chinese national anthem played during his victory ceremony and said, "I'm just a soldier." The silver that the Italian women won in the 4x200 relay? Italy's first-ever world championships medal in a relay event. This is all of course directly attributable to Michael Phelps, even though he is not here in Kazan, part of the fallout from his drunk-driving case. When Phelps was a teenager, he famously said his primary aim was to grow the sport of swimming. At these Kazan worlds, there are a record 189 countries taking part. More, the rest of the world saw what Phelps famously did in Beijing in 2008, when he went 8-for-8. In thousands of towns all over the world, young swimmers — or would-be swimmers — said some variation of, that looks cool. South Africa’s Chad le Clos used to watch Phelps on YouTube — then took him down in the 200 fly finals at the London 2012 Games. 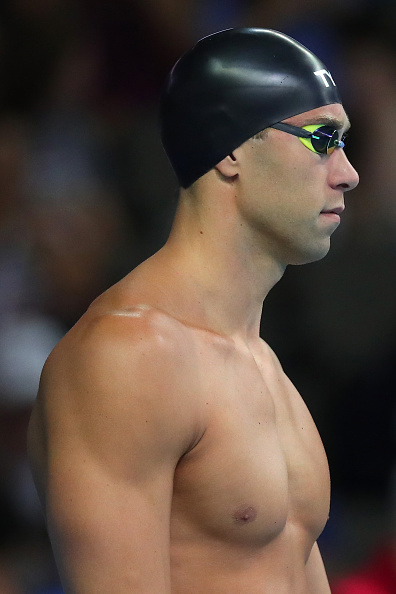 Think about this: a swimmer who was 11 in 2008, when Phelps dominated Beijing, is now 18. — Should there be a change in the way the U.S. picks its world championship team? This one was named a year ago. That didn’t allow for the emergence of swimmers who found themselves either at the Pan American Games in Toronto or the World University Games in South Korea. — Because the athletes knew a year ago that they were on the team, did that lead to some measure of slacking off? Where, over the past year, was the accountability? All Olympic sports are by definition demanding but swimming all the more so. The sport reveals, especially in the final 50 meters, whether you have put in the work. — How do the racers deal with what has seemed so evident here, that many American swimmers seem to be kicking out from the blocks with a case of nerves? Or -- to put it another way -- a lack of confidence. This is of course difficult to assess and fix. Preparing for a high-level swim meet involves putting down a block of work, then resting — “tapering” is the word of art — before the meet itself. It used to be that Americans would taper for maybe one major meet a year. Many swimmers from around the world have adopted a different approach, and as a consequence their times — and perhaps more important, world rankings — reflect that. It’s a fair question whether you can be feeling your confident best when, before the meet, you look at the rankings and, as a for instance, find yourself in the 20s or 30s. — How do the coaches get better? Not just the athletes themselves but the coaches. USA Swimming runs a decentralized system in which an athlete trains with a coach of his or her choice; the governing body gets everyone together for meets; thus, what responsibility do the coaches bear for this performance and what, if anything, to do about it? Frank Busch, USA Swimming’s national team director, would never criticize any of his swimmers in public. It's for sure not his style. In an interview with the USA Swimming website, he singled out for praise Ledecky, Lochte, Franklin and some newcomers, including Ryan Murphy (his 52.18 in the Wednesday prelims leading off the mixed 4x100 medley would have won the 100 back, and he touched second Thursday in his heat and overall in the 200 back semis) as well as Katie McLaughlin (sixth in Thursday night’s 200 butterfly after being ahead going into the final turn, American Cammile Adams taking second). — Make no mistake: world-class swimming is a professional sport. But this is not the NFL nor NBA. The challenges for many U.S. athletes of monetizing their talents remain considerable — as well as the time balance required to make money and still train hard. Here is the balance: is doing a clinic for, say, $2,000 or $5,000 worth it? Here, too, is reality: $2,000 or $5,000 might, for many U.S. swimmers, be a considerable payday. Lochte, of course, who for years has been a worldwide sensation, has no such worries. His issue, just like Michael Phelps, is that time always wins out in the end. Phelps is 30. Lochte turned 31 on Monday. Absent some freak development, Rio 2016 figures to mark the end, or at least the beginning of the end. Lochte said late Thursday that he is now one of the team's oldest swimmers, wryly noting that he could remember when he was one of the youngest. He also said that Phelps -- who is swimming this week at the U.S. nationals -- had texted to say that he, Lochte, now had to step up. "Whenever Michael says anything to any swimmer, you’re going to take it to heart just because he is the world’s greatest swimmer that ever lived," Lochte said. "The things that he said -- saying, 'You've got to be a team leader, you've got to put Team USA on your shoulders, you've got to carry them through this meet' -- I definitely took that to heart." The 200 IM that Lochte won Thursday made for his 24th medal at a world championships, more than anyone except Phelps, with 33. Earlier this week, Lochte finished fourth in the 200 free, just as he had done at the 2013 Barcelona worlds and the 2012 London Games. In the 200 IM, though, he cruised. He finished the 200 IM semifinals with the best qualifying time, 1:56.81, and that despite an easy glide to the wall at the end. In Thursday’s finals, he was down nine-hundredths of a second at 150 meters, then poured it on to run down Pereira. Lochte’s gold made for the fourth straight time he has won the 200 IM at the worlds — after Rome 2009, Shanghai 2011 and Barcelona 2013. Going back to the Montreal 2005 worlds, Thursday’s race also marked his sixth medal in a row in the event (silver, Melbourne 2007; bronze, 2005). Only Grant Hackett had ever won an event at four editions of the worlds running; he won four 1500s. Lochte has also won three medals at the Olympic Games in the 200 IM. Acknowledging Ledecky's "phenomenal" performance, Lochte said, "I am definitely really humbled about getting that win tonight and hopefully I got the ball rolling for Team USA." Pereira, meanwhile, won two bronze medals two years ago in Barcelona. Now he has silver. He led the race at 100 and 150 meters.